I love making fabric flowers! The possibilities are endless. These are gorgeous! Be sure to check out all three parts. funny, I just posted about flower-making tutorials! I'm definitely adding this page to my faves! 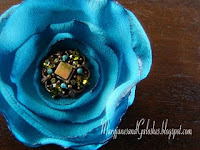 I am obsessed with fabric flower pins....so, why shouldn't I be able to make my own? Thanks for the tutorial!! Thank you. This tutorial is fabulous!! I am about to launch into making bridal corsages for my bridesmaids & flower girl.